Spectacularly maintained by a couple of hipsters, this charming and quirky carriage home is perfect for your eclectic buyer. As is the case with true carriage houses, the open-concept main floor provides opportunities for different layouts, while the upstairs loft has slightly lower ceilings and skylights conducive to sleeping and the work-from-home lifestyle. PLENTY of storage -- outdoor shed, under-stair closet, walk-in closet with w/d in the bedroom. The private courtyard is wonderful for gardening and offers an inviting entrance to the home for guests. **NEW EXTERIOR PAINT AND BRAND NEW WINDOWS** New water heater and interior paint. 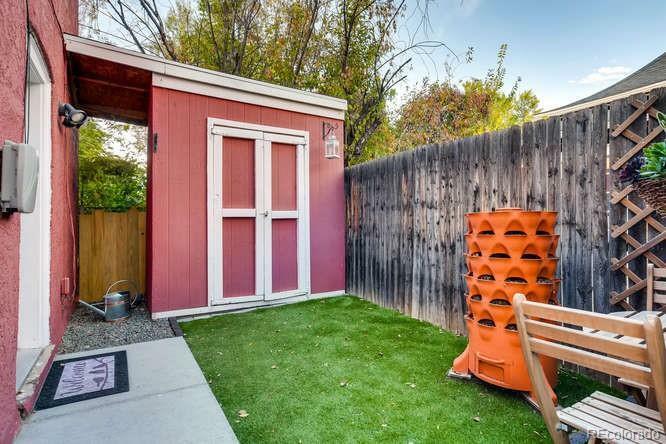 One deeded parking space, off the alley, right next to the home. Access home from Pennsylvania St., through the gate with the 523 address OR from the alley on the West side of the home. NO SHOWINGS UNTIL FRIDAY, FEB. 8. Offered by Lockley Real Estate.